Long time followers of my blog will know that Iceland is one of my favorite travel destinations. I had the opportunity to visit again, this time bringing my wife along for the first time. This was my fifth time to the land of fire and ice, and in all my time traveling, I have accumulated some helpful travel tips that I would like to share with you. A big downfall when traveling abroad is not having access to your standard phone network. That means you have to wait for wifi access back at the hotel to share all your amazing travel experiences with family, friends and social media. The good news is Iceland offers a service where you can rent a small device that is a portable wifi hotspot, giving you access to Facebook, Instagram, and in my wife’s case, Pokemon Go, anywhere. Up to 10 devices can connect simultaneously and the rental comes with a USB charger. Be sure to prepay on the website. We chose the option for $10 a day. We picked ours up at the Dunkin’ Donuts inside Keflavik airport as soon as we got off the plane. Once powered on, you connect your phone to the wifi signal like any other device and enter in the password provided on the packaging. Make sure you follow the directions on the packaging and register your Trawire device on their website before leaving the airport. I recommend having a USB adaptor for your vehicle’s cigarette lighter. That allowed us to charge the Trawire while driving so it never died on us. Be advised, the device you are getting is not new. Ours was pretty scratched and beat up but that did not affect its functionality at all. To return it at the end of your trip, simply insert it into the prepaid envelope and mail it in one of the red drop boxes marked “Posturinn”. There is one located near the check-in area for Icelandic Air near the airport’s entrance. Iceland’s weather is known for being unpredictable and can change rapidly and drastically. This can make planning your excursions difficult, especially if you’re trying to glimpse the Northern lights in Iceland’s notoriously overcast skies. Give yourself a fighting chance by using the following websites and apps for the most up to date forecasts on weather patterns and the auroras. Also DO NOT forget to visit the tourist information sign before exiting the airport as it gives you basically all the information you need to a safe and happy adventure in the land of fire and ice. The website https://www.vedur.is/ also provides weather updates that are constantly updated throughout the day. This is especially helpful since the weather can go from sunny to stormy in a matter of minutes. If you’re looking to chase the auroras, I recommend downloading the phone app appropriately names Aurora. I find it’s the most accurate app that forecasts the aurora’s location and intensity and can really help make your hunting expedition a successful one. Aurora is free on the Apple app store and Google Play. Every time I go to Iceland, I try to save money by finding the cheapest car rental available. They are all inevitably off site, meaning a shuttle is required to get to the rental branch from the airport. The problem is that the wait for a shuttle can sometimes be an hour or more, and lines at the branch can mean waiting another hour just to sit with a representative and process the necessary paperwork. When you’re tired and jetlagged from a long flight, the last thing you want to do is wait around for a shuttle. I recommend renting from an in-house rental company for faster service. 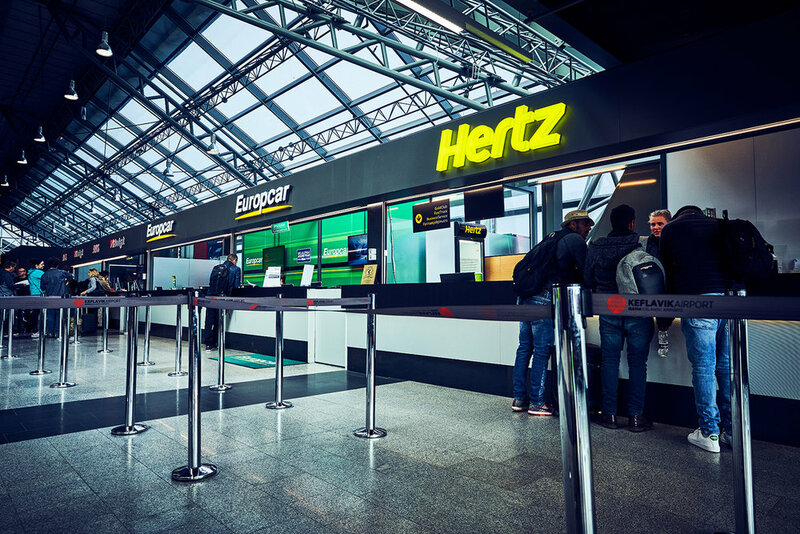 Hertz, Europcar, Avis and Budget all have rental counters in the arrivals section of the airport. Lines tend to not be as long and you can get your rental immediately without waiting for a shuttle. If you are looking to rent a camper van, renting off site is unfortunately your only option. I have used both Kuku Campers and Go Campers which provide modified campers that have a built in kitchen and sleeping area make them an alternative to staying in a hotel. While this is a great alternative for travelers that want to see many of Iceland’s attractions that are separated by large distances, know that the initial wait to get your rental may be a long one. Check out these sites below for more details on renting campers in Iceland! ﻿4. Use Gas Cards, Avoid The Fees! I have made the mistake in the past of using my credit card to pay directly at the pump. Depending on your credit or debit card, using it at the pump can result in hefty transaction fees. The pump also requires a pin, even for a credit card, and some American credit cards don’t have pins. A solution for this is to buy a prepaid gas card inside the gas station. We bought gas at N1 where their cards come in 3000, 5000 and 10,000 isk increments. This is especially handy if you’re travelling with a group of friends who are all pitching in for gas. Everyone can buy their own gas card and use it accordingly. It really helps to keep track of how much everyone contributed to the tank. Once purchased, simply insert the card face up with the N1 logo facing left into the appropriate slot in the kiosk outside Input your pump number and pump your gas as normal. This trip marks my first trip to Iceland’s world famous Blue Lagoon. While booking ahead of time is not required, it is highly recommended since it will guarantee access to the Lagoon at a specific time. The starting rate is about $60 which will get you access to the Lagoon and includes a drink at the bar. Yes, there is a bar in the lagoon. You also get to try on their standard silica face mask for free. 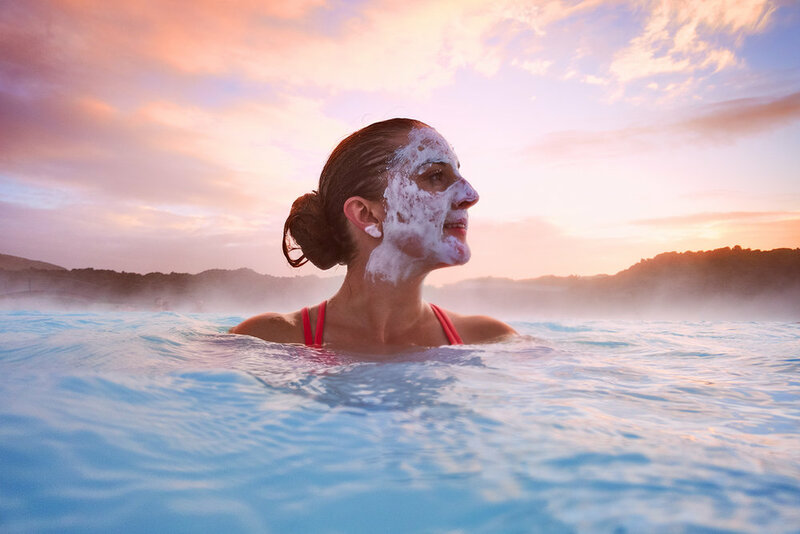 My wife and I booked the premium package which starts at about $80 and provides the additional perks of a robe and flip flops, an extra drink, and the option to try a different facial mask in the lagoon. They are very strict about not entering the lagoon until your appointed time, so although we arrived an hour early, we were not admitted until 15 minutes prior. A microchipped bracelet is issued that acts as a key to your locker in the changing room. It is also scanned at the bar and any drinks consumed over your assigned limit will be recorded on the bracelet and billed to you prior to leaving the resort. Our time slot was for 4pm, which turned out to be a good time because it allowed us to see a beautiful sunset in the lagoon and made for some fantastic photos. Waterproof plastic phone protectors are available for purchase that will allow you to still use your phone while in the water and will save it if it accidentally goes for a swim. I shot all photo and video on the Sony RX0, which is a very small, high end waterproof camera perfect for situations like these. The lagoon is definitely a change of pace from the epic landscapes I prefer to photograph, by my experience there was definitely an amazing one and absolutely worth the money. I recommend everyone make it a part of their Iceland visit, but it does require some planning ahead. In the arrivals section of the Keflavik airport is a small kiosk that invites you to take the responsible traveler’s pledge. It lists some do’s and don’ts of being a good traveler and I recommend everybody read it and take the pledge! Iceland is a beautiful place and should be treated with respect. Please don’t be “that guy” that gives visiting tourists a bad reputation! If you enjoyed this article and are interested in purchasing the gear used to create these memories and helpful tips please use the links provided. You can also visit my gear page here. It won't cost you a penny more and you will be helping me continue to bring you stories of exploration and inspiration. Thanks again!